The last day of the year! Perhaps, more than ever, I am grateful to have 2016 fade into memory. 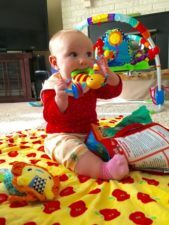 Looking back over my blog, it has been a good year. Perhaps my eagerness to let it go stems from the fact that the post-Thanksgiving weeks of 2016 seem to have been filled with family illness and stress. Who would not want to have that fade away! But, when I step back and glance through my posts for the past year, I have to admit that it has been a pretty productive year. I completed a number of art quilts that I am pleased with, donated a number of quilts and tops to Quilts Beyond Borders, entered a few shows and was pleased to be accepted, took the time to take two classes with Elizabeth Barton, and continued throughout the year to be part of Karen Ruane‘s hand stitching groups. 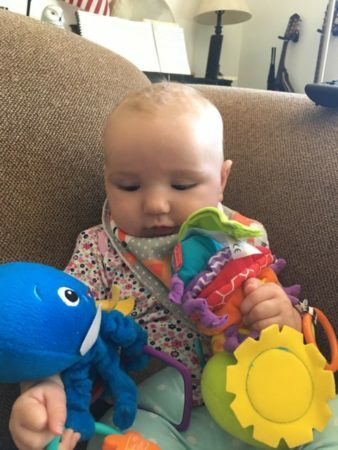 In my personal life, it was my first complete year living out west and the most memorable event undoubtedly was the birth of my second grandchild, Miriam, in March. Her arrival certainly dominated my life for the remainder of the year. Of that, I have no regrets. Kahlil Gibran’s words have been one of my favorite mantras for years. I first heard it in a workshop I took with author Tom Crum many, many years ago. It was probably one of the spurs that drove me to work with Tom for twenty-five years facilitating getting his work out in the world. As the holiday season descended upon us, it felt only appropriate to me that one of my goals should be to complete another quilt top for Quilts Beyond Borders. I mentioned in a post last October that Susan Schmidt, my region’s coordinator, had given me a huge bag of fabric cuttings, all from one manufacturer, and asked if I would like to try to ‘design’ a few quilts out of them. 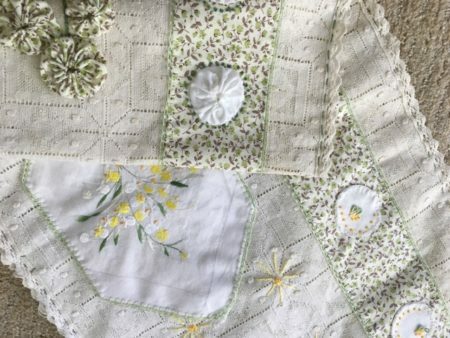 I had already sent Susan two quilts and what was left was an assortment of strips of varying widths and lengths that looked as though they were mainly selvedge strips, perhaps from backings that long-arm volunteers used in quilting tops. I emptied out the bag, cleared my design wall and started pinning up random pieces to confirm if there were enough for an actual quilt. I could see that there were just enough if I was really careful in how I pieced the strips. So, for a few days, as I worked on other projects in my studio, I gradually rearranged my ‘raw material’ into a more pleasing layout. I gave the project a working title of “Waste not, want not” as I stitched pieces together. There was a certain amount of pleasure in knowing that even the remnants of other donations were being sewn together to give someone a gift of warmth in this holiday season. Hats off to this wonderful organization that provides comfort and support to those in need throughout the year. 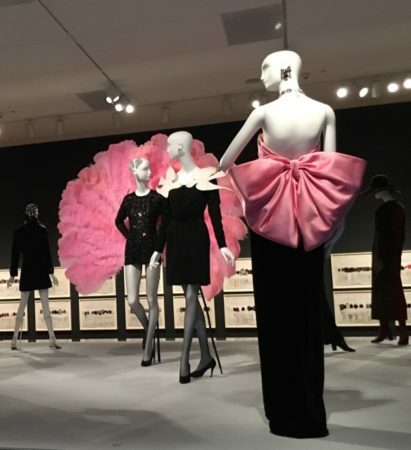 This fall I have had the opportunity to visit the Yves St Laurent exhibit at the Seattle Art Museum twice! 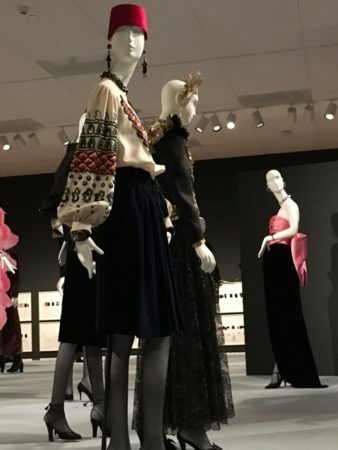 The museum has really created a breath-taking exhibit of his work. 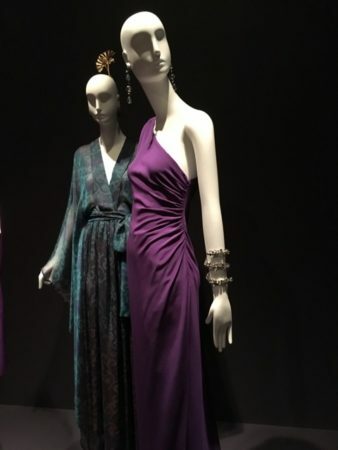 Each time I visited the experience was uplifting and I learned a little more about the genius that was Yves St. Laurent. 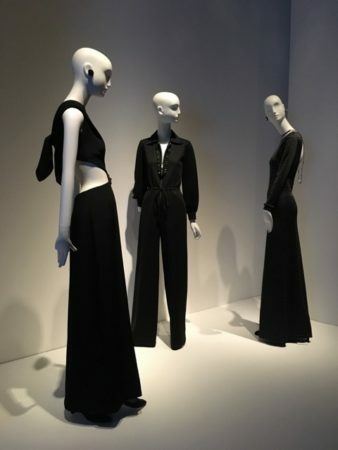 There is a simplicity of line in all of Saint Laurent’s designs. 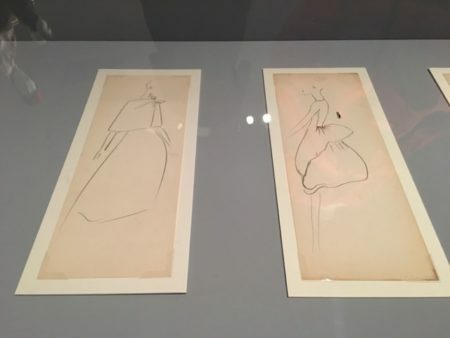 You can see it both in these sketches included in the exhibit and in this display of his dresses. 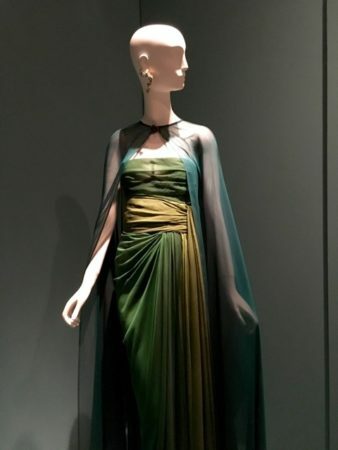 One particular design element that attracted me were the gentle wraps of fabric that are present in many of his designs. And, then there were those designs that just held your attention for their astounding creativity. The exhibit is at the museum through the holidays so if your travels take you to Seattle, I hope you will be able to check it out. There is so much more on exhibit. 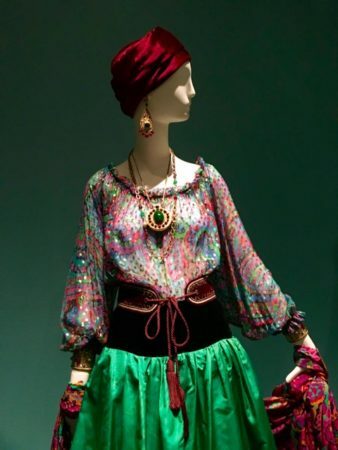 If you can’t, here is a link to a brief slide show on Sant Laurent and the exhibit created by the museum that you can enjoy. from the memory of time. Quote greeting you as you descend to the floor of the museum. I spent the weekend after the U.S. election immersed in the Ground Zero neighborhood. In the end, it was an uplifting trip. The events of September 11, 2001 are etched in the beings of most Americans who were alive on that day. Having grown up in New York City with parents whose lives revolved around the New York financial district, the horror of that day pierced me deeply. St. Vincent’s Catholic Medical Center, which waited on alert that fateful day for the injured that never came, was a mere block from my grandmother’s apartment. Over the years, I have visited the site many times…….weeks after the attack, I peered through fencing at the wreckage. As years passed, I followed the debates over moving forward with what was surely hallowed ground. 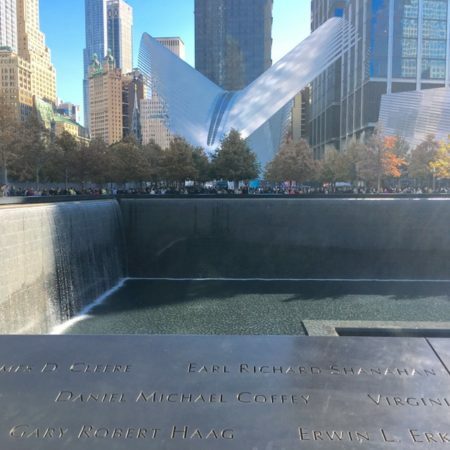 Eight of the sixteen acres were used to create a park where the footprints of the destroyed buildings hold reflecting ponds with waterfalls that are lined with the names of those who died either on that day or in the earlier attack on the trade center. I visted those ponds when they opened to the public. 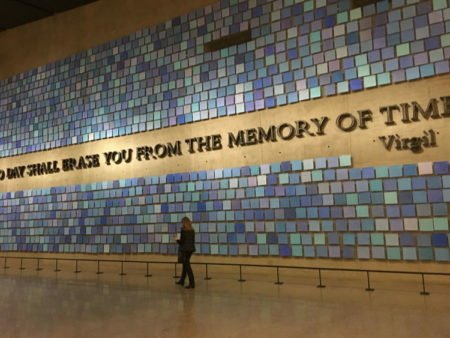 This time I had tickets for the 9/11 Memorial Museum which now stands on the site. I confess that as I traveled down into the museum proper I grew increasingly nervous. As images of the two towers still standing abounded, I needed to stop and breathe a bit. 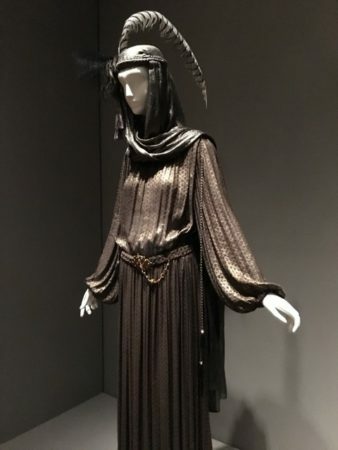 There were tears in my eyes for over half of the time I spent in the museum – I think after that I was numb to the sorrow of what I was revisiting. And then, for me, it was over. Back above ground with thankfully beautiful fall weather, I spent the rest of my weekend wandering the neighborhood that now surrounds the site. Some of the buildings were present in 2001. St. Paul’s Chapel stands across the street from site. Only one window pane was broken during the attack and for nine months the church served as an oasis with services for those working at the site. These days tourists wander in and out of the chapel. The Bell of Hope rests in the chapel grounds. It was gift to NYC from the city of London and has been rung every year on the anniversary of 9/11. It is a peaceful place. 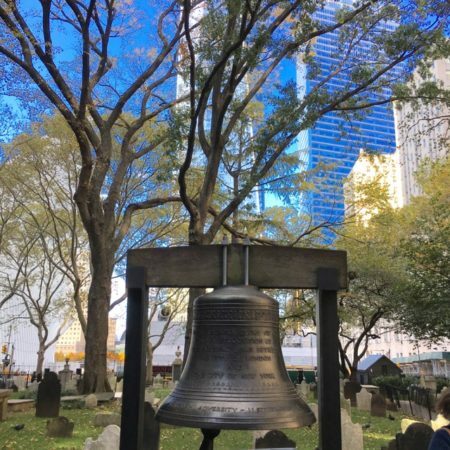 “Bell of Hope’ on the grounds of St. Paul’s Chapel with Freedom Tower in background. This was my first visit to the area since the Occulus has been completed. 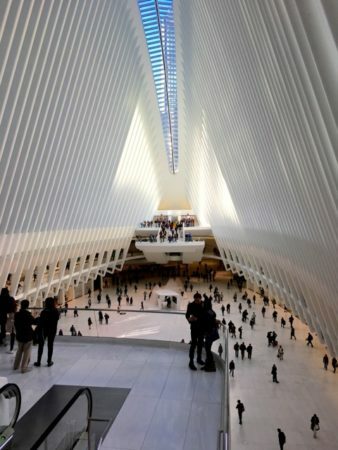 Designed by architect Santiago Calatrava, the hub not only is an embarcation point for over 250,000 daily commuters but a tourist mecca of shops and restaurants, all in a massive white open space. However, it is the roof design that is magical. It reminds of wings of a dove, rising from the depth of ground zero, carrying hope for our future. Oculus roof rising from the reflection ponds of Ground Zero. The theme of openness is carried into other complexes being built in the neighborhood. 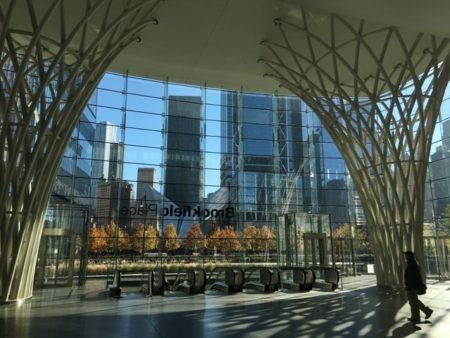 Brookfield Place is a complex office, restaurants, and high end stores that complements the WTC site. 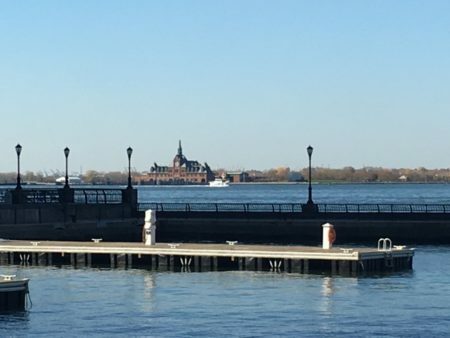 Outside the complex, one can see in the distance, Ellis Island, where so many of our ancestors first set foot on U.S. soil. It is a good reminder of how our country has always been built upon diversity. By the end of my visit, my spirit did feel uplifted. What happened on 9/11 will forever remind us of the horrors that human beings are capable of; what has been created in the years since in the area reminds us both of the goodness that was manifested that day by victims and survivors and the courage and commitment to moving forward positively that is the bedrock of this nation’s being. That bears remembering after this election season!! What ever happened to World Peace? ‘World Peace’ was the working working title for the art quilt I blogged about in early September. The irony of that title often had me chuckling this fall. It was a great idea – combining the old Irish language of Ogham with popular symbols of peace to create a vertical wall hanging. 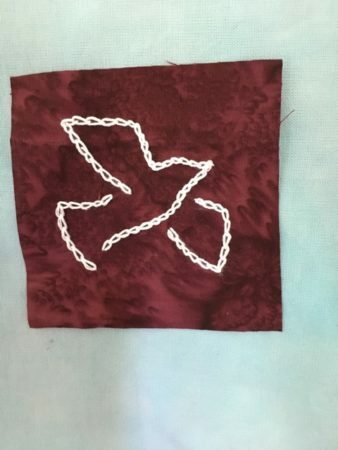 The 3 inch square blocks containing the symbols offered an opportunity to spotlight my hand stitching. 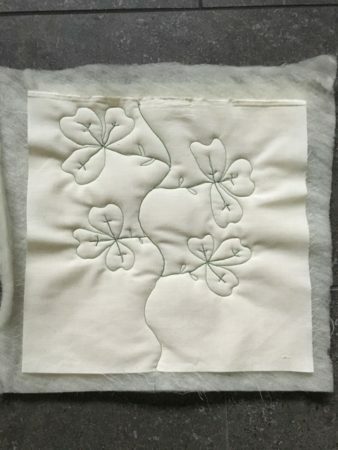 A technique I had used years ago to reverse appliqué blocks using some of my Bernina’s decorative stitches felt like just the right touch. I had the perfect piece of hand dyed fabric for the background. For six weeks I sampled and played. All seemed to be going well. But then I began to pull it all together. The thought ‘world peace is never easy’ went through my mind repeatedly. The best laid plans just didn’t come together just right. I found myself thinking ‘ well, that doesn’t look too bad’. There came a point where I stepped back and realized that I was thinking that thought just too many times. And so, ‘World Peace’ was put to rest. I withdrew from the challenge and redirected my energy to other projects. I have been busy with Quilts Beyond Borders and my class Wrapped and Bound in Stitch with Karen Ruane. It has been a few weeks now. I think it is the first time I have actually stopped creating a piece so far into the process. 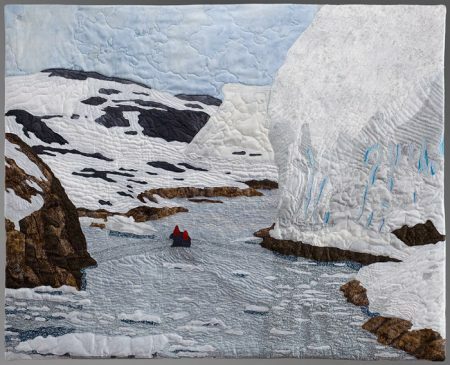 It definitely felt strange at first – particularly because no other art quilt project replaced it. It was the last piece that I had planned to make in 2016. And, world peace? Well, it certainly doesn’t look like the world is embracing it just now……..the past few days I have wondered about cutting up those less than perfect elements of my abandoned quilt and reconstructing a more chaotic portrayal, perhaps with lots of question marks… After all, ‘world peace’ would be messy and certainly not simple. The bottom line though is that, really, it is not a concept to be given up on. We will see what 2017 brings. For now, I will leave you with a song that speaks to the need far better than any words I can write. How sad that this performance was 26 years ago and we are still waiting. and a time to every purpose under the heaven! It’s been a month since I last wrote. For my own sanity, I needed to take a break. I hold that life is good and can always find the silver lining in every cloud. But, even for me, the optimist, there are times when life can get pretty overwhelming and lots of deep breaths are called for. 🙂 And so, about a month ago, I realized that I was going to have to make some choices and one choice was to let my blog rest for a few weeks so I could put my energy to other purposes. I estimate that I should get at least two more tops out of the scraps. There are a number of larger rectangles which should easily yield one top. After that, I will have a collection of much smaller pieces. Any thoughts on creating a top from them are greatly appreciated. I should mention, if you happen to be visiting the Houston Quilt Festival in early November, Quilts Beyond Borders will have a table in the Expo. It was just a year ago in Houston that I learned about the organization. I understand they will have 300 kits there for anyone to pick up and take home to piece a quilt. Do take home a few if you are there. I do hope to share more of my activities over the past few weeks in time – just re-learning to pace my writings. In the meantime, you can go over to Nina Marie’s Off the Wall Friday and draw some inspiration from some other artists. Thought I would also share a rendition by Judy Collin’s of my opening quote. It is timeless. 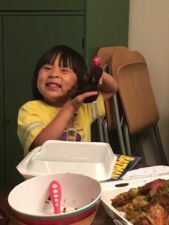 My oldest granddaughter turned five! 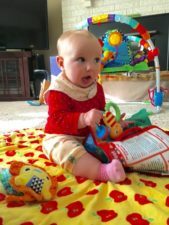 My littlest granddaughter turned six months. Amidst all these delightful occurrences, I made a trip over to La Conner Washington for the first SAQA Regional Meeting held for Washington state. There were nearly 40 of us present, including some SAQA members from British Columbia, Idaho, and Oregon. It was a wonderful meeting. Jane Dunnewold was the keynote speaker and spoke for an hour on the theme of her latest book, Creative Strength Training. I found her to be a warm and entertaining speaker. I have a copy of her book and hope to read it on an upcoming trip. 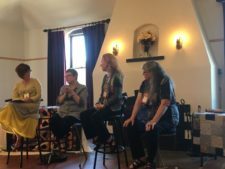 There was also an excellent panel discussion moderated by Patricia Belyea of Okan Arts with panelists, Caryl Bryer Fallert-Gentry, Gail Harker and Bonnie Bucknam. Patricia is an extremely talented moderator who immediately engaged the audience and crafted her questions to bring out the distinctions in the paths that all three very successful artists have chosen. We also were treated to a tour of the La Conner Quilt Museum which was across the street and had time to network and make plans for future gatherings. 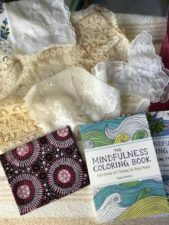 I returned home with some special fabrics and laces from the museum as well as some inspirational coloring books I found in a shop in Seattle. The SAQA auction begins today so I hope that you will take a moment to visit the auction and plan your purchases/donations over the next few weeks. 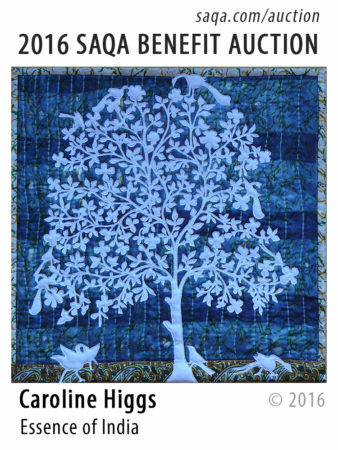 I have been a member of SAQA for many years and watched it grow as the popularity of the art quilt has expanded. The organization has worked hard to create venues where the public can view the amazing art achieved by these fiber artists. At the same time, I see the organization stepping up more and more to support the new art quilter. The auction is an opportunity to support their efforts and come away with a beautiful work of art as well. Progress is made one tiny step at a time. So it was with this week. As I gaze over at my design wall while I write this, I see reminders of this week. No more progress on the ‘World Peace’ theme piece and that ‘Aspen 3’ art quilt is still waiting to be bound. However, the ‘Morning Walk’ art quilt is now completely quilted. 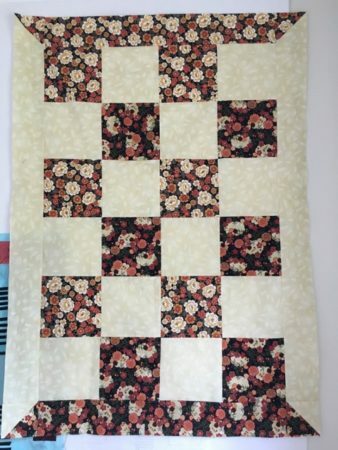 Threads are hanging and binding remains but the basic quilting is complete. I am relieved. I am getting antsy to move on. ‘Morning Walk’ is the last of the major summer projects and fall is beckoning! My goals for fall obviously include the ‘World Peace’ piece but also a new class with Karen Ruane. This new venture is called ‘Wrapped and Bound in Stitch‘. The project for the class is what Karen calls a wrapping cloth. There is considerable leeway, as always, in what we create. Her emphasis will be on a pieced cloth with a child theme. However, I think I am going to choose to work in primarily white-on-white with a circle theme. 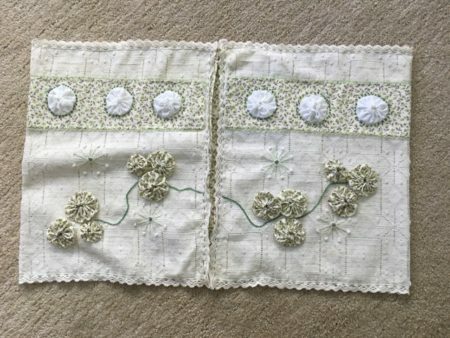 Back in June, I posted a photo of some lace cloth that I had made. Over the summer I gradually added on to that start and as I begin this new class, I hope to continue to grow those pieces into a fuller cloth. It will be an adventure and I am eager to begin now that my summer projects nearing finish. This week also brought some pleasant news. My art quilt, Emergence, was selected to tour in Brazil for 2017 with Patchwork Design 2017. 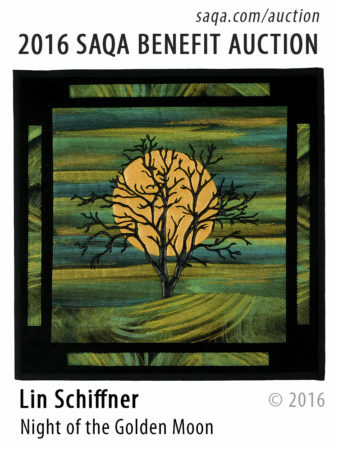 It will be part of a group of quilts representing the Contemporary QuiltArt Association that I joined this past year. I am delighted to have one of the 28 quilts that the Brazilian organization picked and will be shown in venues including Rio de Janeiro and Sao Paulo. The 2016 SAQA Benefit Auction that I wrote about in August will be starting on September 16. It is a wonderful opportunity to acquire some beautiful works while supporting a good organization. You can learn more here. 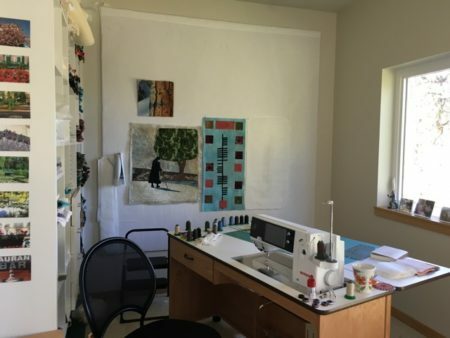 Along the way, I made an executive decision that I personally was dissatisfied with the quality of my finished quilts for Quilts Beyond Borders. The bindings must be machine stitched to guarantee they will stand up to wear and tear that one might envision in refugee camps, etc. And, my skills at machine stitched bindings have never been great. Rather than abandoning an organization that I truly want to support, I inquired more about doing simply quilt tops. For now, this seems a better path for me. So, I created my first top this past week. For several weeks, I also have been considering ideas for a quilt challenge that had drawn my attention. The challenge, entitled Dream On, is sponsored by Stretching Art and Tradition. If you would like to learn more about the group and their history, please check out their website. Dream On is their 18th year of challenges! For Stretching Art and Tradition 18, Dream Big! Dream house, dream job, dream body, dream quilt – if dreams were reality, what dream would you have come true? 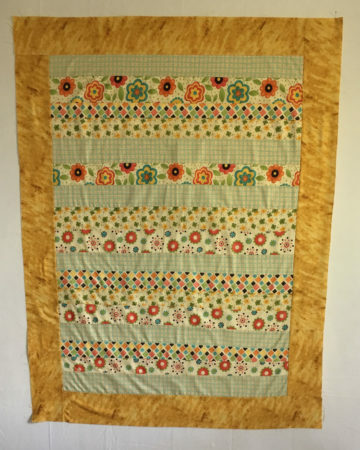 This year, complete a quilt 18″ wide by 36″ long using any technique you choose to represent your dream. After meditating a bit on the words ‘dream on’, the persistent image that kept repeating in my mind was my daughter’s classic response when someone asks her what she wants: “World Peace”. 🙂 And so, I chose ‘Peace’ as my theme as since way back in the 60’s, peace has been a theme and value that has always resonated in my life. Over my trip to Seattle, I contemplated how to create an art quilt on ‘peace’ in the size constraints of the challenge. About the same time, I was reminded both by a DNA test that I participated in and a note from a new-to-my-knowledge distant cousin that my heritage is strongly Irish. Coincidentally, a ring that I had purchased years ago with an inscription in the ‘old Irish’ language of Ogham resurfaced. Ogham is written with a series of lines running down a central line. It can run horizonally or vertically. With that knowledge, it was a natural jump to the gaelic word for peace, síocháin, and its depiction in Ogham along a vertical line. And so, this week I began to draft out the beginnings of my challenge piece. The design is far from complete but a base plan is hanging on my design wall – in paper and in cloth – for inspiration as I make further design decisions. Am I as far as I thought I would be with the design process at this point? Definitely not! Life does have a way of intervening. But, at least I have started! Linking to NinaMarie’s Off the Wall Friday. Amazing how experiences tie together. Last weekend I was in Seattle briefly and visited the Seattle Art Museum. I wanted a chance to view their exhibit, Graphic Masters: Durer, Rembrandt, Goya, Hogwarth, Picasso and A. Crumb, before it closed this coming week. I loved studying the work of artists like Albrecht Durer whose prints were amazingly detailed. 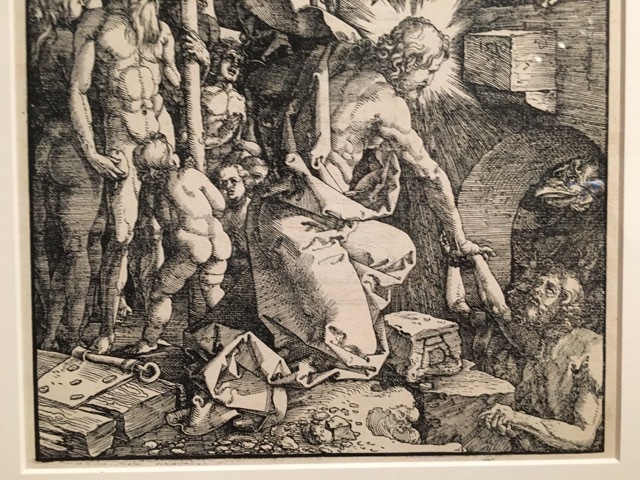 Check out the complexity of this portion of The Crucifixion by Durer and how he accomplishes form and texture through simple lines. When I returned home, as I continued to work on the cottage window, I remembered Durer’s use of lines and focused on both density of line and open space as I completed the quilting. I am quite pleased with the results and will be happy to include it in the Irish series that I am definitely creating. Linking to Nina Marie’s Off the Wall Friday so you can check out other artists. 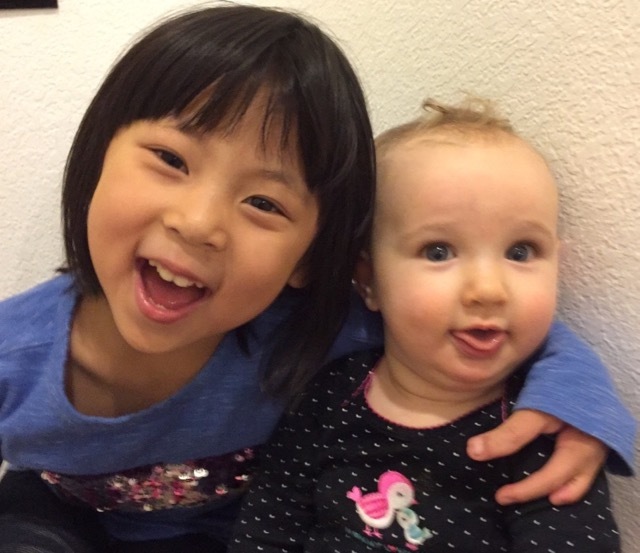 Play energizes us and enlivens us. It eases our burdens. and opens us up to new possibilities. 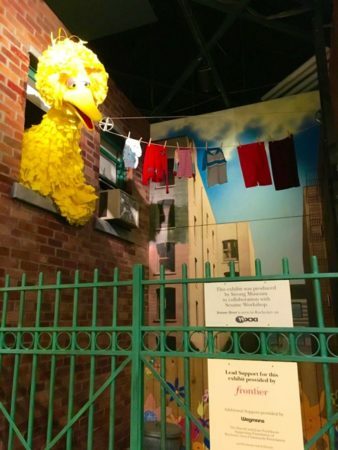 While back in upstate New York last week, I had the opportunity to visit the Strong National Museum of Play. 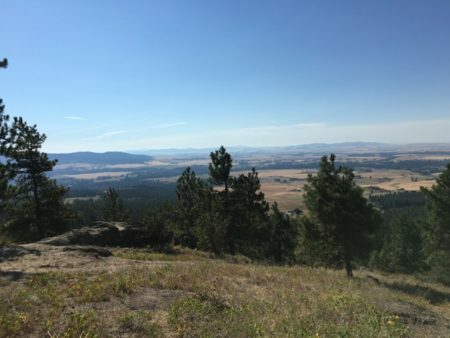 Having spent an afternoon immersed in Sesame Street, Star Wars, train sets and a pretend grocery store, I found it difficult to return home and not remember what Ralph Waldo Emerson wrote, “It is a happy talent to know how to play.” And so, I took some time to hike to a beautiful view not far from my new home. Inspired, I returned to my studio and got down to business. 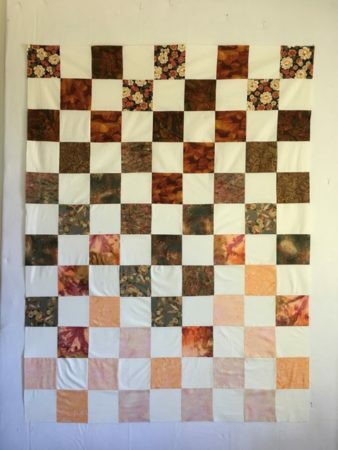 One of my first projects was to quilt Aspen III. I had written about Aspen II a few weeks ago. 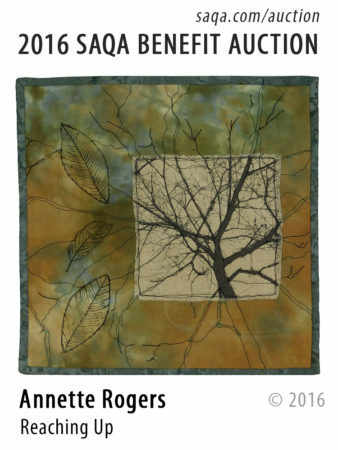 Aspen III is a foot square version where I chose to highlight different aspects of the image with my FMQ. Here you can see the results even though I have yet to bind it. I am especially pleased with my treatment of snow in this version. I am really enjoying quilting with Hobbs wool batting and silk. It is allowing me to really play with texture options in my quilting. Currently, I am working on another piece which will become part of a series on the West Coast of Ireland. 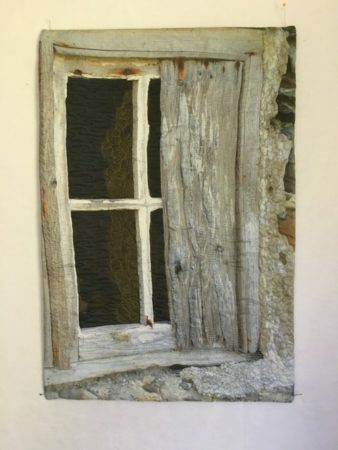 This is a window from the cottage that I quilted and wrote about several years ago and that I was able to photograph in detail on trip in late 2014. 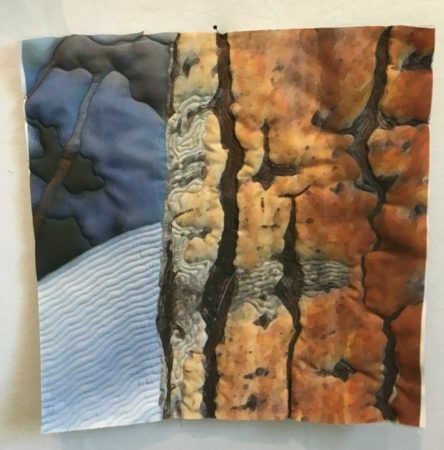 You can see from this photo of a section of the piece that creating texture through selective stitching is playing a large part in this composition. Can’t wait to play some more! SAQA will be having their annual auction next month, beginning on September 16. It is always an opportunity to support this dedicated organization while acquiring a foot square art quilt by one of your favorite artists. 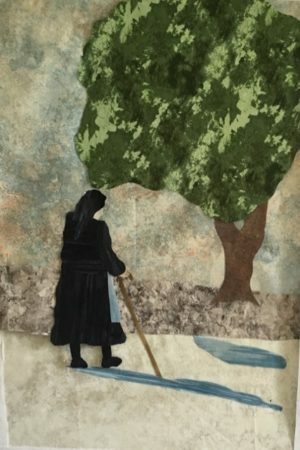 As a lead-in to the auction, members are invited to create their own dream collection of art quilts that will be available in the annual auction. I could not resist the invitation to do so. My dream collection is entitled ‘Trees that Speak to Me’. I have always found silouhettes of trees catch my attention and cause me to stop, breathe, and contemplate. 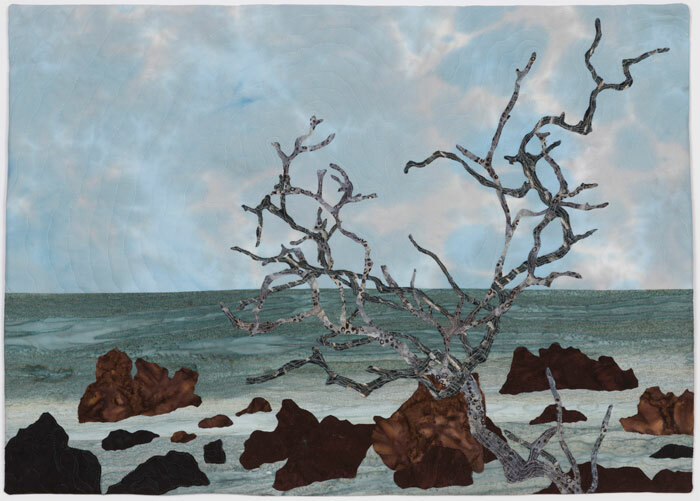 In this collection, some of the art quilts are simply stark branches while others still have leaves. All caused me to pause, appreciate the artistry both of the fiber artist and mother nature. 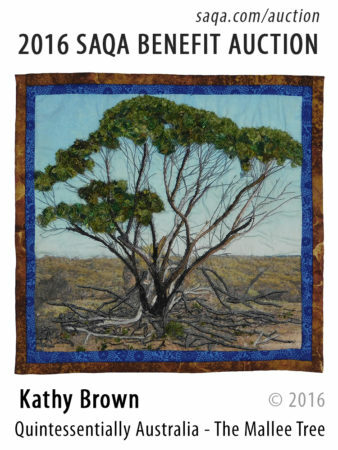 To view all of the art quilts in the auction, you can click this link. To understand how to bid on art quilts when the auction begins on September 16, you can click on this link. Since I moved to the western side of the U.S., I have mainly been using cotton batting in my art and charity quilts. Most has been purchased at the local JoAnn Fabrics, primarily Warm & Natural and Mountain Mist. While satisfactory, I found them a bit heavy to move around while quilting. I remembered using wool batting back in NY but could not remember the brand. I put out a query on a Yahoo group I belong to and asked what people use. 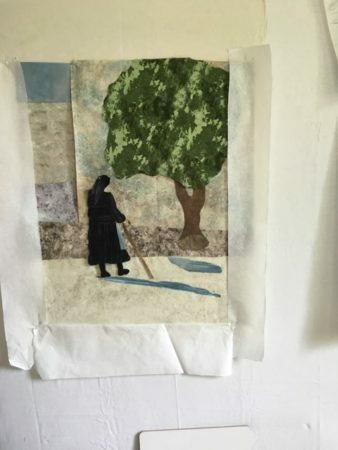 Some art quilters used cotton, others used wool, and a few mentioned a felted batting. I did some research on the felted suggestion but found quite a few comments on the stiffness of the batting. 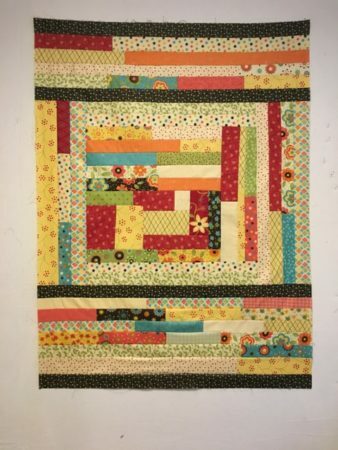 Since I do not use a long arm and need to be able to easily compress my quilts as they pass under the arm of my machine, I was hesitant about how I would like it. In addition, I could not find it packaged in a small amount so auditioning it would have been a sizable investment. Instead, I decided to revisit wool batting. I had one piece that I had brought out west and made myself a small cotton muslin quilt sandwich to free motion quilt upon. 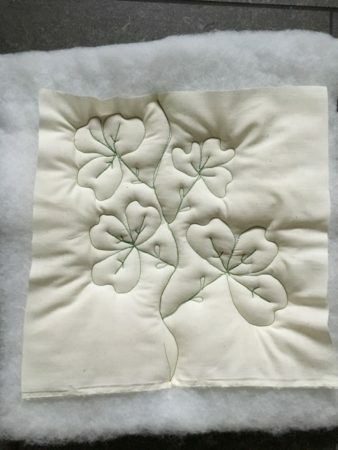 I had come across a Shamrock Design video by Lizzie Leonard a few weeks ago that I really wanted to try. So, I decided to use that on my sandwich. I found it quite difficult to move the sandwich as I quilted the design. The batting was quite thick – almost an inch – and I did try lessening the pressure of the foot to ease glide. However, the resistance was intense. 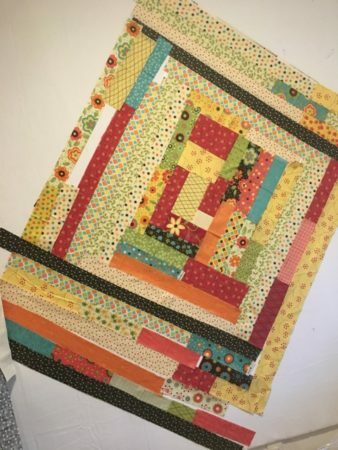 While the texture created by the high loft was appealing, I couldn’t visualize quilting a larger piece with the same issues. Instead, I ordered some of Hobb’s Tuscany Collection 100% wool batting which advertised a loft of 1/4 – 3/8″. It was available in a crib size package so, in contrast to the felt batting, I could sample without a large investment. I created a similar size sandwich and used the same shamrock design. With the lower loft, the sandwich glided through my machine without a problem. I could easily manipulate the fabric and liked the resulting surface texture. My next step was to try the batting with one of my art quilts. 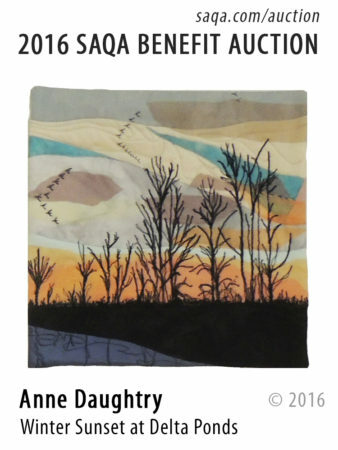 Several weeks ago, I had asked my friend, Julie Brandon, at Red-Dog Enterprises to reprint the image I had used in my art quilt, Aspen. 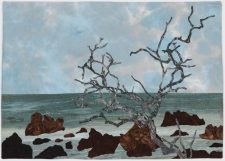 The piece sold so quickly I barely had time to enjoy it – a nice problem! Julie reprinted several of the image on silk habotai for me and I used one of those images with the Hobb’s batting and a cotton backing to play. 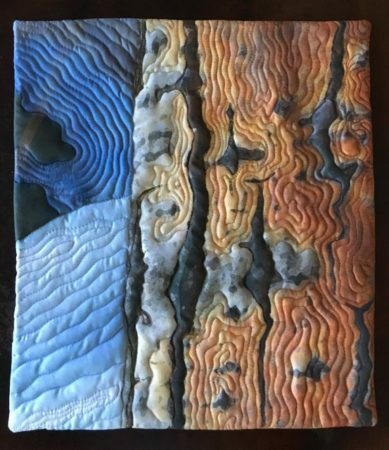 The finished piece, Aspen II, is about 11″ x 13″ and went together like a dream. I think I have found my batting of choice. While not an issue since this is an art quilt and won’t be subject to washing, the packaging does say that the batting is washable. I probably will test that out before I use the batting in a lap quilt. 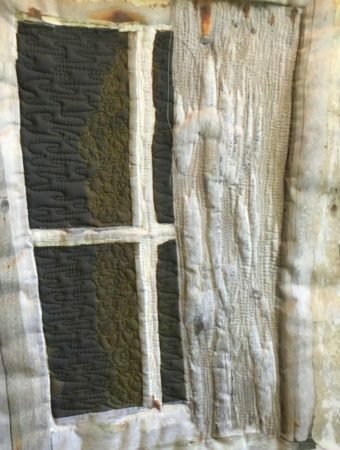 I did use a steam iron on this quilt without a problem and fused the batting to the silk with MistyFuse before I quilted it. The batting held up fine through these processes. 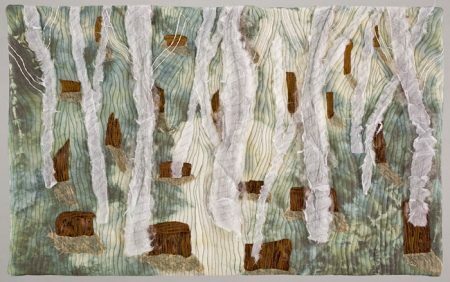 I am looking forward to next quilting my larger Morning Walk piece and a third quilt in the Aspen series using the Hobbs’ batting in the next few weeks . 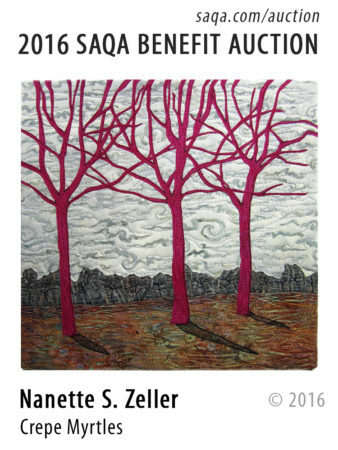 Linking to Nina Marie’s Off the Wall Friday so you can see what other fiber artists have been up to. This week I discovered the documentary series, Chef’s Table. It is in its 4th season so perhaps many of you have been enjoying it for a number of years. I do not spend much of my time watching television so I make no claims to be up on all the latest shows. However, now that I have found this series on Netflix, I am in love with it and encourage you to seek it out and enjoy a few episodes. I think that it will send you back to your studio energized and eager to move forward with your current projects. Each episode is about one renowned chef. It draws upon chefs from all over the world and interviews them at length about their lives, their philosophy, and how they cook. The artistry of each chef comes across to the viewer through not just their words but incredible photography of the dishes they create and the environment in which they choose to create. I find myself inspired by both the beauty of what I am seeing and the fervor of the individuals that has driven them to create. To give you a sense of the series, here is the promo video for the first season. Enjoy! the next best thing is the wrong thing, and the worst thing you can do is nothing. Should I play with my octopus or my smiley face???? Wish I could say that I can offer a finished piece and resolution of all my indecisiveness but that is just not the case. I spent hours experimenting – a very good thing. And, I did make decisions. And, I did actually start fusing elements! Starting from the draft above, I experimented with a number of choices and finally decided that the blocks were not necessary. Next I focused on the tree, some angulation issues that were bothering me, and the placement of the woman relative to the tree. She had been much further to the left of the tree in earlier drafts. You may be wondering about ‘the fence’. I haven’t decided! 😈 The suggestion to play with adding fence in an iPad app is tempting me, as well as the suggestion to add in some strips of fabric to simulate a fence. 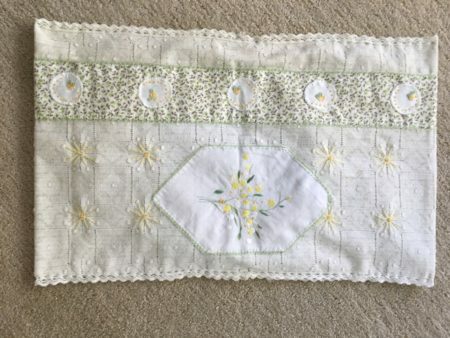 Plus a friend in my stitching class with Karen Ruanne just posted a beautifully stitched window grate that really tempts me as a possibility. At this point, I like the direction of the piece enough to devote time in the next week to exploring these possibilities along with finishing off my shadow work. Hopefully there will be another update next week! This week’s focus has been my art quilt, Morning Walk, which I sketched out in Elizabeth Barton’s class, Inspired to Design. I wrote about the sketch a few weeks ago in a post and received some great encouragement. 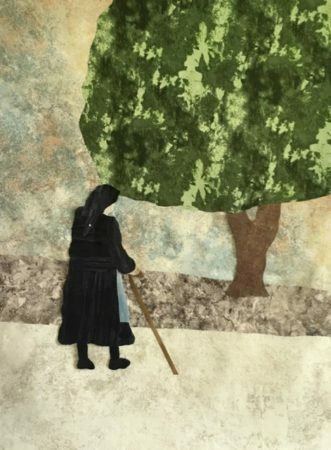 The photo that inspired the sketch was taken in Crete a few years ago – a local woman walking along the street. As is traditional in smaller villages on the island, the older women all dress in black. 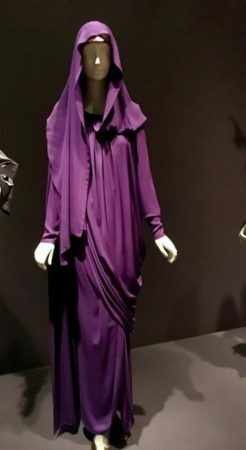 It brings back memories of my childhood growing up in a Sicilian neighborhood in New York where black was worn by all the old grandmothers. I knew that a totally black figure would be a bit challenging to convey and so I made it my first effort. I didn’t want to follow my more typical process of beginning with a background and then building upon it. After all, what if I couldn’t finally capture the sense of a woman walking and was left with a blank background? I really shouldn’t have worried. The woman came together fairly quickly. The rest of my week has involved play on a background for her. 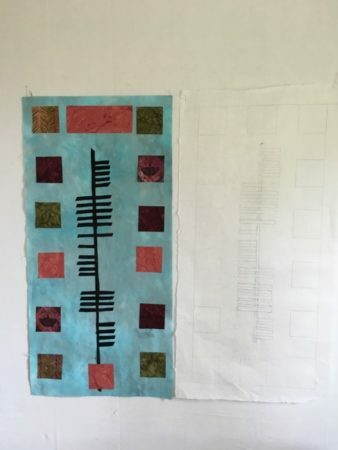 It is still in draft stages – simply blocks of fabric on my design wall with the start of a tree. 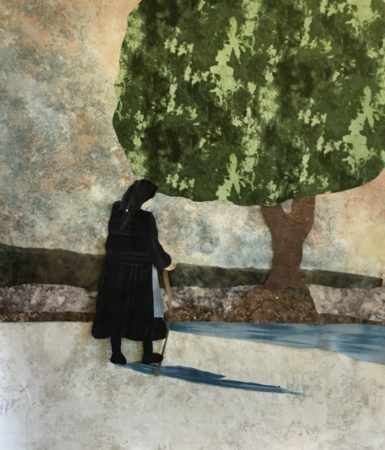 Here is a cropped photo of its current state as I audition background elements and positioning of my lady and tree. I suspect she will wind up closer to that tree than in this version. You may remember, in my sketch, she is walking along a fenced off area. I really liked that fence and visualized quilting it in with fine lines at the end of the quilting. As I have been playing with a background, one friend wondered if including the fence would be a distraction to the flow of the work. Hmmm? Good time to raise the question. I wonder too. I have asked Elizabeth for an opinion as our class is still going and am awaiting her feedback. I wonder if anyone else has an opinion? 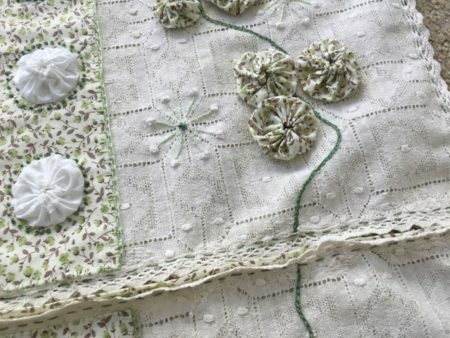 It is convenient that I can continue working on the quilt and make a decision on the fence towards the end. There are plenty of other decisions to be made first as this is definitely a work in progress! Linking up to Off the Wall Friday so you can check out what others are doing as well. A slightly skinned knuckle is keeping me from blogging very much today but those lyrics jumped out at me from the soundtrack of Hamilton that I have been listening to this week. I don’t necessarily agree with the following line in the play, “Don’t let them know what you’re against and what you’re for.” Since I am trying to limit my typing, I will refer you to Richard Branson of Virgin Atlantic for a great blog post on the set of lines. I totally agree that we would have a far happier world if people did just talk less and listened to others! Since today is the start of a major holiday in the U.S. where we pause to remember how this country to which many of our ancestors immigrated began, I will just add a patriotic tune and close. It is pretty hard to find a rendition of just the first verse without a lot of editorial commentary so I hope you won’t mind that I have resorted to a clip from Superbowl XLIX which I realize many of my Seattle friends would like to forget ever happened. leading to the most amazing view. 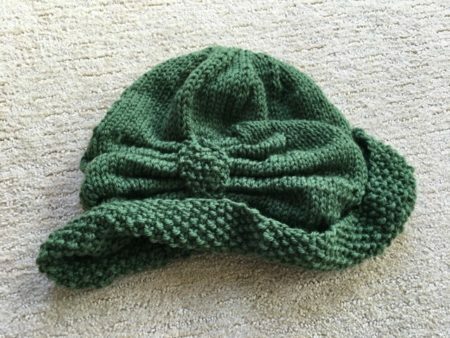 About two weeks ago, fellow artist Margaret Blank included a knit hat among the projects that she had completed in the past week. Now Margaret is a stellar knitter and the hat was a bit unusual. She did an impressive job of knitting it. I immediately fell in love with the hat. 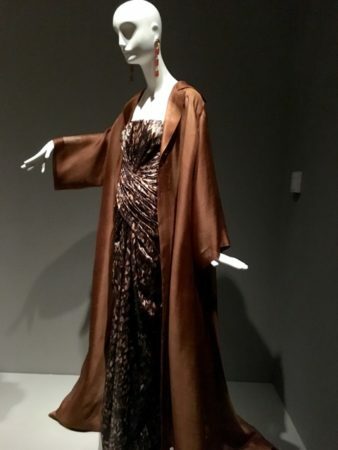 I looked up the reference to the pattern that Margaret kindly included in her post. The write-up did not sound too difficult……..and I really liked the hat. So, I ordered the yarn, Knit Picks Swish Worsted, and waited patiently for its arrival. Well, it came this week and I simply could not focus on anything else. The yarn was absolutely beautiful and so soft to the touch. I simply had to start knitting. 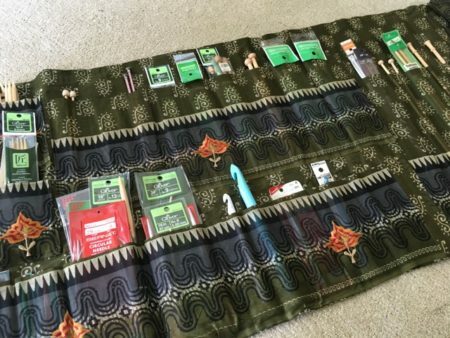 Fortunately, I had brought along my knitting/crochet needles when I moved – all nicely organized in the case I had made from an Indian sari. I have nowhere near the talent that Margaret does but I am persistent. I admit that my hat is probably not as perfect as the one Margaret made, but I completed it in a few days and I like it! It was a pleasant break from my class with Elizabeth which is now winding down. I did do some more sketches for that class and expect to be sharing more as I translate my rough sketches into actual art quilts in the coming weeks. In the meantime, here is my hat! Linking as usual to Nina Marie’s Off the Wall Friday. Let’s see what everyone else is doing!